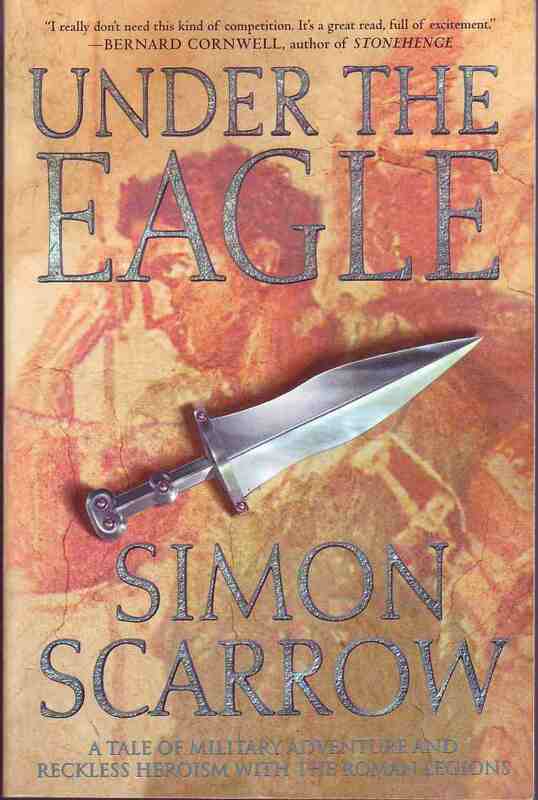 Under the Eagle is the first instalment in Simon Scarrow’s Eagle series of historical novels, which are set around the Roman invasion of Britain in 43 CE. The novel begins on the Upper Rhine in Germany (which is referred to as “Germany”; throughout the novel, Germany is “Germany” and Britain is “Britain”, but France is “Gaul”, Avenches is “Aventicum”, and Boulonge-sur-Mer is “Gesoriacum” - only mildly disconcerting). Quintus Licinius Cato is a raw recruit in the Second Legion. Cato does not match the typical profile of a prospective legionnaire; he is a skinny, awkward, former palace flunky, a slave who has enlisted in the legion in order to secure his freedom. Whatever is Macro, the battle-hardened veteran who has fought his way up from the ranks to become a centurion, to do with his new charge? 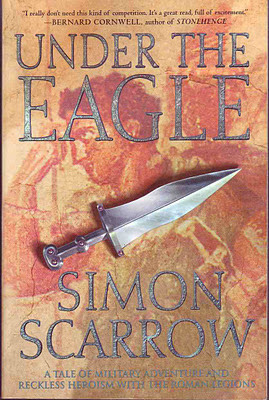 The flyleaf of Under the Eagle informs the reader that the book’s author, Simon Scarrow, is a history teacher (El Tarangu’s edition is quite old; it is likely that Scarrow has given up the day job by now). This detail resulted in El T feeling a little disappointed upon finishing the book; for a military history novel written by a history teacher, Under the Eagle didn’t contain a huge amount of historical detail. Aside from learning that all Roman fortresses were laid out to the same specifications, and that new legionnaires trained with wooden swords for the first few weeks, the reader does not learn much about day-to-day existence in a Roman legion. El Tarangu wasn’t expecting the level of scholarly minutiae that Robert Graves provides the reader, but a little more historical detail, without it unduly interfering with the plot, would have been nice – Robert Harris struck a nice balance with Pompeii, for example. Inevitably, there are a number of anachronisms. Macro does at one point ask Cato if he has “scored” – this in relation to an attractive slave-girl that Cato is enamoured with – and legionnaires are referred to as “squaddies” by one character (late 20th century British Army slang, for those of you not familiar with the term), but the historical inaccuracies are seldom, and are usually not too distracting. The author does conjure up one intriguing scenario in having Vitellius and Vespasian enter a sort of Machiavellian pact with regard to taking over the empire. The impact of this was almost lost on this reader, however; even though both characters feature frequently from the book’s very beginning, El Tarangu had forgotten that both Vitellius and Vespasian later went on to become emperor until the two enter into their uneasy alliance towards the end of the book. And while El T has previously read Suetonius and probably should have realised the historical significance of the two characters earlier, this reference was probably lost on some readers, particularly younger ones. And, while on the subject of historical personages, El Tarangu spent the first hundred-or-so pages wondering if the Macro in the novel, a grizzled, somewhat coarse soldier of humble origins, was the same person as the historical Macro, who was also a soldier of the legion from a similar background. They weren’t the same person, by the way - wrong reign; we really must dust off our copy of Suetonius and give it another read. Plot-wise, the book is a page-turner. There are two good battle scenes, some political intrigue, a brief love interlude – Under the Eagle reads very well in a rollicking sort of way. A little lightweight, but never less than enjoyably diverting, Under the Eagle would be good for a holiday read. Buy Under the Eagle from Amazon. Buy Suetonius’s The Twelve Caesars from Amazon (the Robert Graves translation, naturally).